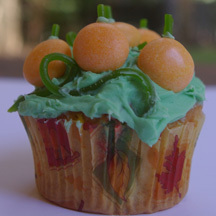 Make this pretty pumpkin cupcakes for Halloween or any fall festivity using only fruit gel candies and green writing icing. 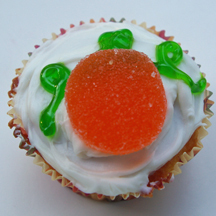 What You Need: 1 cupcake; white or off-white frosting; 1 orange gel candy; green gel or writing icing in tube. How to Make It: Frost cupcake. Place orange gel candy on it. Use writing icing to draw pumpkin stem and vine. That’s it! You need a nice, tall cupcake for this Halloween or fall pumpkin cupcake, so fill the baking cups three-quarters full rather than two-thirds. 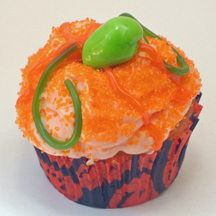 What You Need: 1 cupcake; orange frosting; orange sugar or sprinkles; orange gel or writing icing in tube; green candy laces (optional); green Laffy Taffy, Starburst or similar chewy candy. 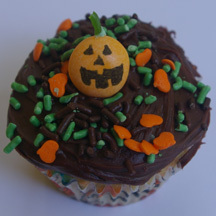 This Jack o’ lantern cupcake comes with his own handle! But don’t try to pick him up; it’s just licorice. 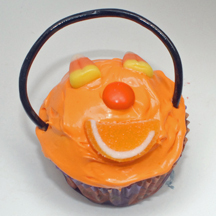 What You Need: 1 cupcake (baked and cooled); white or off-white frosting; orange food coloring (paste or mix red and yellow liquid food coloring); 2 candy corns; 1 orange M&M; candy orange slice; length of black licorice. Take a break from scary Halloween cupcakes and mellow out with these pumpkin patch cupcakes featuring mellocreme pumpkins. What You Need: 1 cupcake (baked and cooled), white, off-white or chocolate frosting, coconut flakes, green food coloring (liquid or paste), mellowcreme pumpkins. How to Make It: Frost cupcake. 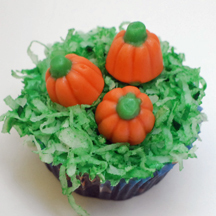 Tint small amount of coconut flakes green and sprinkle on top of cupcake for “grass.” Add mellowcreme pumpkins. So easy it’s scary! Make up a whole batch and you’ll have pumpkin fields forever.